* Mariell's classic Cubic Zirconia Bridal or Bridesmaid Earrings are 1 1/2" h x 1/2" w with brilliant CZ stones in a CZ bejeweled frame. * Plated in no-tarnish Genuine Silver Rhodium, these popular dangle earrings will look like new for many years to come. 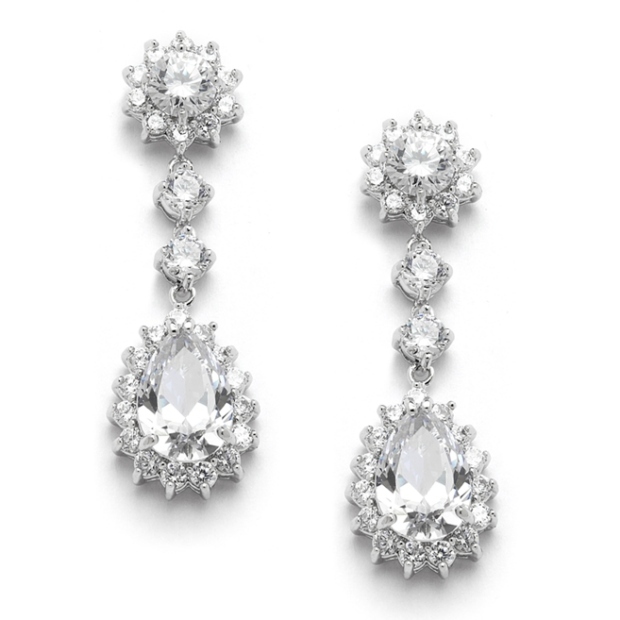 * These Mariell earrings feature top quality Cubic Zirconia stones with shimmering CZ bejeweled frames. * These wholesale wedding or bridesmaids earrings offer brilliant shine yet affordable low pricing to your collection of top selling bridal earrings. * Our classic design gives these earrings the versatility to be worn at the wedding, the honeymoon and for nights on the town. * Your clients will get years of use out of this sophisticated CZ jewelry.